A Complete & Balanced Way to Pep Up Meals! 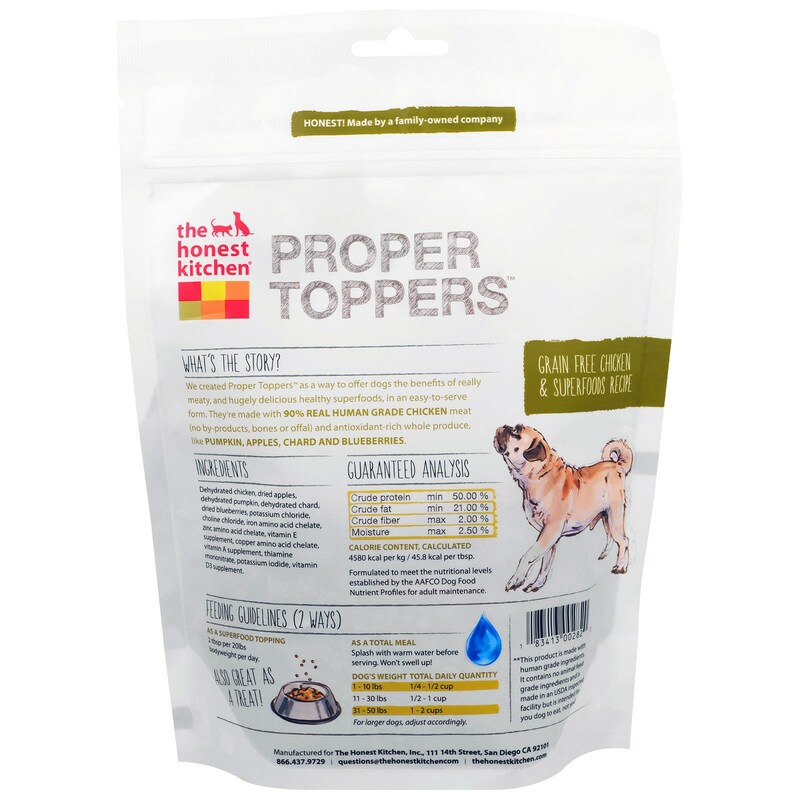 We created Proper Toppers as a way to offer dogs the benefits of really meaty, and hugely delicious healthy superfoods, in an easy-to-serve form. They're made with 90% Real Human Grade Chicken meat (no-by-products, bones or offal) and antioxidant-rich whole produce, like Pumpkin, Apples, Chard and Blueberries. **This product is made with human grade ingredients. 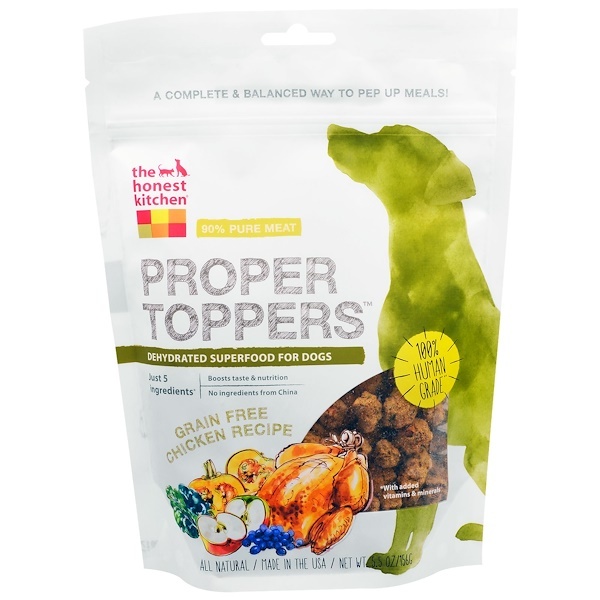 It contains no animal feed grade ingredients and is made in an USDA inspected facility buy is intended for your dog to eat, not you! As a Superfood Topping: 2 tbsp per 20 lbs bodyweight per day. As a Total Meal: Splash with warm water before serving. Won't swell up! For larger dogs, adjust accordingly. Also great as a treat! Dehydrated chicken, dried apples, dehydrated pumpkin, dehydrated chard, dried blueberries, potassium chloride, choline chloride, iron amino acid chelated, zinc amino acid chelate, vitamin E supplement, copper amino acid chelate, vitamin A supplement, thiamine mononitrate, potassium iodide, vitamin D3 supplement. 4800 kcal per kg/45.8 kcal per tbsp. Formulated to meet the nutritional levels established by the AAAFCO Dog Food Nutrient Profiles for adult maintenance.